Today is an exciting one for our team at Trifacta. With the Amazon Web Services re:Invent conference taking place in Las Vegas this week, we thought of no better time and place to share what we’ve been working on with AWS over the past year. Our announcement at the conference covers quite a bit material so I will use this blog to break down everything we’re doing with AWS and provide a little more context as well. It’s no secret that cloud computing is undergoing a phase of massive growth with a growing number of organizations more heavily relying on cloud services to handle their data management workloads. In our conversations with prospects, customers and partners, it’s absolutely clear that the cloud is playing an increasingly important role in the computing workloads of businesses around the world. Our response to this shift kicked off a few years ago when we decided to accelerate our support of the cloud ecosystem and deploying Trifacta on various cloud platforms. One of the first public proof points of our cloud focus was our collaboration with Google on Cloud Dataprep and now continues with today’s announcement of our expanded support ofthe Amazon Web Services ecosystem. Expect a lot more from us in this area moving forward. As part of today’s news, we’ve officially launched our presence on the AWS Marketplace by making our Wrangler Pro and Wrangler Enterprise editions available for purchase through the marketplace. Both of these offerings are completely optimized for AWS with support for a broad range of services including S3, Redshift and EMR and deployment via an AMI. Wrangler Pro is optimized for moderately sized data preparation workloads that don’t scale beyond 30 users and 40GB of data per workflow. We provide several different EC2 instance options for users to select from depending on the makeup of their use case. Wrangler Pro leverages our Photon Compute Framework to provide super fast data transformation execution for workloads that don’t require parallel processing. The nice thing about Pro on the AWS marketplace is you can be up-and-running in under an hour. Simply select the instance you want to deploy on and install the Trifacta AMI. If you’re not on AWS, we also offer a Trifacta managed version of Pro where we handle all of the software/hardware management so you can focus on wrangling. More information on that offering is available here. Wrangler Enterprise is designed for more demanding data wrangling initiatives that span a greater number of users and larger data volumes. With native integration with AWS EMR, Trifacta recipes compile down to elastically scalable data processing jobs leveraging Spark on EMR. For more information on Wrangler Enterprise on AWS, sign up here. At re:Invent today, AWS is also launching its big push into machine learning with the unveiling of the new Machine Learning Partner Solutions category on the marketplace and the AWS AWS Machine Learning competency. Just like the massive uptick in adoption happening in cloud computing, machine learning is going through an equally impressive stage of growth (if not more impressive). As anyone who has performed machine learning can tell you, the ability to source clean, well-structured data for model development and training is critical to the success of any ML initiative. We’re seeing more and more data wrangling users focus on machine learning as the downstream use of the data they are wrangling in Trifacta. 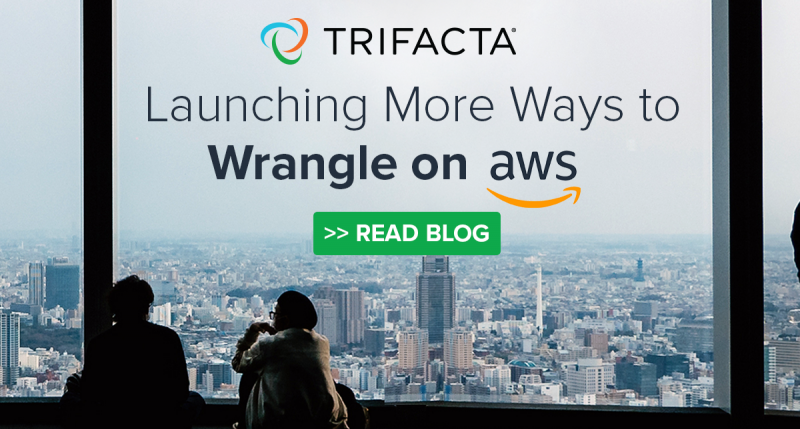 It’s extremely validating to have AWS recognize data wrangling as a critical aspect of the machine learning workflow and to also have their team feature Trifacta in the launch of this new ML category and competency. We’re excited about the continuing growth of the machine learning market and the increasing need for faster, more accurate data prep to feed these projects. Next Post: New Features Now Live in Wrangler!